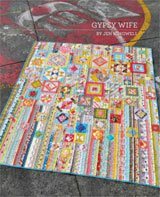 This is a quilt that exceeded all of my expectations! In my dining room, I have a wall hanging that matches the design on my special company dishes with grapes. It makes the holidays feel special. 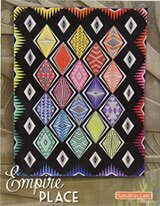 I wanted to make another wall-hanging just for Hanukkah and found the center panel on e-Bay as well as the other Hanukkah prints. 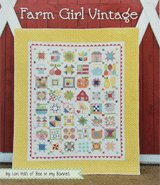 The pattern is based on the Attic Window quilt design. Unfortunately, I confess to being "dimensionally-challenged". My original wall hanging measures 26"x35". The center panel of my quilt easily overran my original intent. As I added in all of the other "windows" and the borders, the quilt just grew and grew into a full-sized bed quilt. At first I felt kind of stupid, but the quilt had a mind of it's own and as I worked on each section, I fell in love with it. 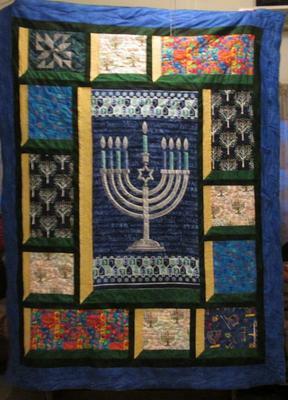 I free motion quilted stars (of David) over the side panels and outlined the Hanukkiah in the center and added some wavy lines between the text. 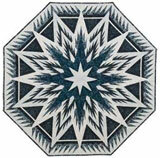 The border is quilted with metallic thread in a star design that won't show up in pictures no matter how hard I try. This was my first attempt to work with metallic thread and I found it very, very difficult. My old sewing machine hated the stuff and the tension caused the thread to break often. This is my second Attic Window quilt and I plan on making more of them in the future. The possibilities are endless. Its a beautiful quilt to celebrate a special time of year. 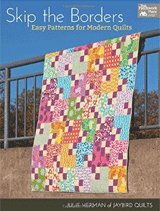 I agree...sometimes those quilts just have a mind of their own about what size they are going to be! I love it. Hope to make one next year.